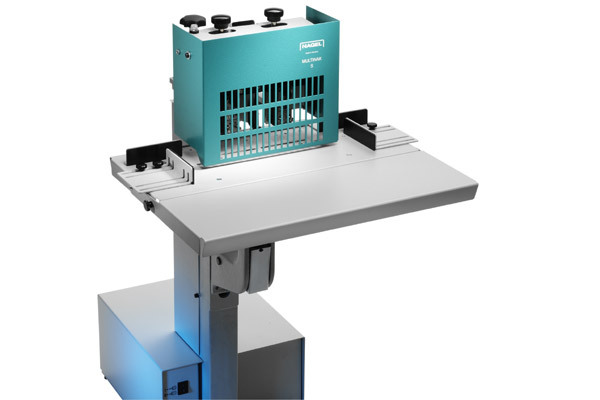 The Multinak FS is a twin-headed stapler that staples booklets and pads up to 27 mm. The machine is particularly efficient when it is used for frequently changing rung lengths. 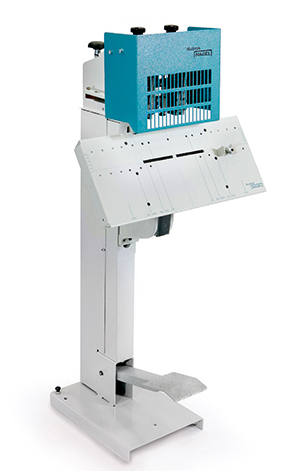 Its versatility and durability have made it indispensable to the graphic arts industry. The change from flat to saddle stapling is done by simply flicking over the table. The precision stapling heads ensure a high reliability; all wear parts can be easily replaced. 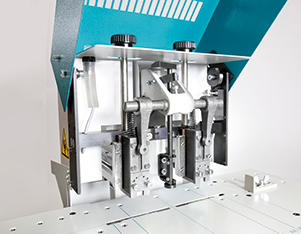 Mobile clenchers press the staple ends flat against the paper to ensure strong, perfectly formed stitches. The distance between centres is adjustable between 80 and 155 mm. The Multinak FS can process 5 different staple gauges, including loop staples. Alternative stapling heads are available for pads between 15 and 27 mm. The model Multinak FS is designed for those working on a smaller budget. Treadle operated, it will handle the same document thickness as the powered version. For longer runs we recommend the powered model Multinak S (with a silent special gear motor).